Wow! The comments from my Wednesday post were so interesting! 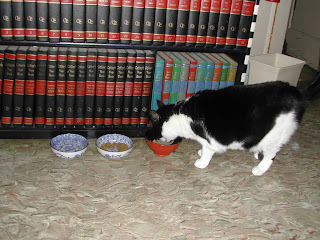 So many of you commented about the books in the bookshelf (they are an old set of encyclopedias) and the fact that I have three bowls of food. That needs some explaining. So here goes. 2. The middle bowl has my crunchies. I get a bowl of crunchies for breakfast every day. Mom doesn't take it away. 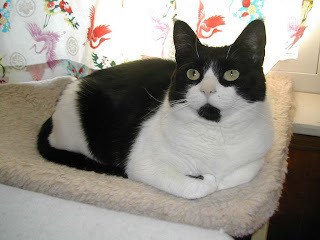 Since I like stinky goodness better, I am angling for getting it breakfast and dinner, and my strategy is to avoid eating the crunchies. 3. For dinner, I get a little can of beef stinky goodness. That's the third bowl. 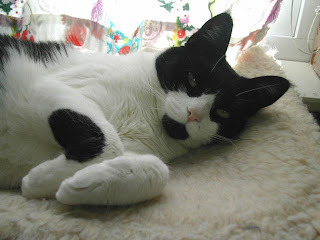 (Usually I eat the crunchies during the night, so my strategy isn't working.) I prefer Fancy Feast Beef Stinky Goodness. I don't like the sliced or chunky versions. I like the plain one. I don't like the expensive pet-food store stinky goodness either. Finally Mom's getting smart about it. She came home last night with a big bag full of the stuff. One final note about the bowls. 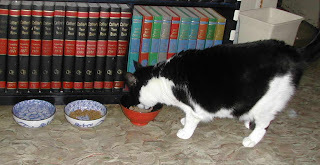 Obviously they are not your usual pet food dishes. Mom says if she has to look at them, they have to be pretty. So my dinner bowls are a nice collection of Japanese porcelain rice bowls. Mom loves the Movies. I dunno what this guy, Oscar, has to do with the movies, but she watches him every year. Last night she watched him again, and she scared me a coupla times when she jumped out of her chair and started squeeing. What did she squee about? What can I say? She's weird, is all. 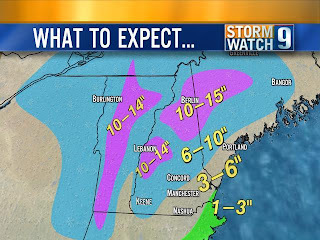 We're supposed to get snow today and tonight. Yech. Mom went out food hunting last night so she won't have to go out today. She bought me a big bag of crunchies the other day, and she also bought me some new fancy stinky goodness. I licked the juices, but left the rest. She finally got the message last night, and took away the so-called fancy stuff and gave me the Beef flavored Fancy Feast I like better. What can I say? She got a book in a box from the guy in the bloo shorts yesterday and she has had her nose stuck in it all day. She's just so hard to train. Cripes, you'd think she was a cat. Regular readers will know that I only started sitting next to Mom a year ago. I would only sit next to her if she didn't have anything on her lap, not even a fleece blankie. I wouldn't sit next to her if she was reading a book or a magazine, and certainly not if she was working on her tippy-tappy lapbox. But life changes. Today I sat next to her while she sewed the binding on her Alphabet Sampler Quilt. She got up to get a drink of water, and I stayed where I was. She took this picture. Don't I look cute? 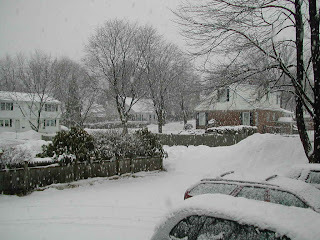 Lookit these gi-normous snowflakes that fell yesterday morning while Mom was getting ready to go day hunting. Mom said there were many magical sliding cars while this was happening. Fortunately hers wasn't one of them. Mom has been sewing the binding on her Alphabet Sampler Quilt a little bit each night. 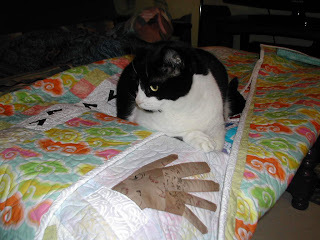 Here I am snoopervising her work and giving the quilt a QA inspection. 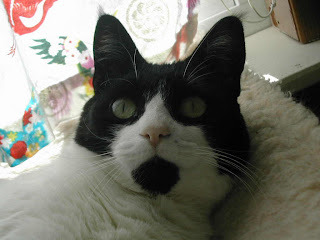 I understand a stork will be visiting Monty Q's house later this year. I guess it wouldn't be a surprise to anybody if I said Mom is gonna make a quilt for this tiny bean. She already has big plans. It's so nice being a cat. One day is as good as any other when you've got a nice comfy napping spot. 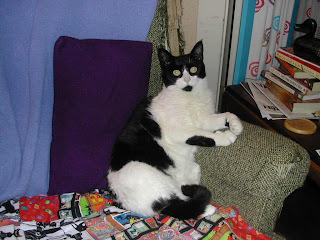 For Angel, who asked yesterday: Mom is sewing the binding on her quilt by hand. She has arthur-itis in her right hand, and she can't see very well up close (because she's getting old), and she needs a wicked bright light (same reason) so she only does a little bit at a time. It is sunny outside, but these two guys, with their sunny smiles, always warm my heart. 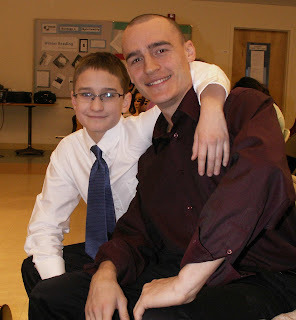 It's PlusOne and Mr Karate. Yesterday Mom had a very nice Valentine's Day with Mr Karate. They had a nice lunch (bacon-lettucte-tomato and avocado sandwiches with spicy mayo on toasted bread), and then did a little "retail therapy." (Mr Karate bought a waterproof jacket for bicycling, Mom picked up a couple of little things for these two guys, both of whom have birthdays coming up). Then they went to see Slumdog Millionaire. What did Mom think about the movie? To answer that, Mom wants you to read this first sentence of Ty Burr's review of the movie from last November: I'll keep this simple: Cancel whatever you're doing tonight and go see "Slumdog Millionaire" instead. Later, Mom went to the store and bought the soundtrack to Slumdog Millionaire, which she has been listening to all morning while sewing the binding on the Alphabet Sampler Quilt. I think this special Gizzy Quilt, that Mom made for my sweetie, Monty Q, expresses my Valentine's Day sentiments perfectly. Happy Valentine's Day Monty Q! I'm checking out the Alphabet Sampler Quilt. 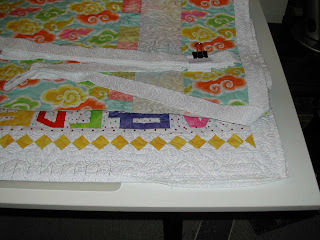 If you want to see the whole thing, you'll have to go over to Mom's Quilting Blog. 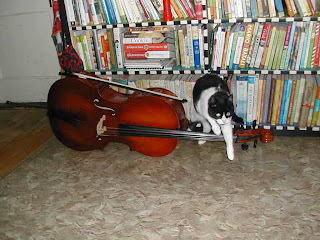 I was sniffing Mr Karate's cello, peeking out from behind it, when Mom saw me and grabbed the camera. Ha ha ha! I was too quick for her. She didn't get the cute picture she wanted. Too bad! 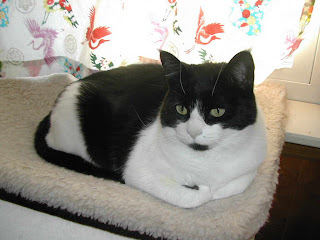 And as for Monty Q, I really don't know anything. 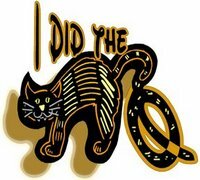 I don't! Nobody tells me anything, because we all know how I can't keep a secret. Of course, I'm not any good at lying either. 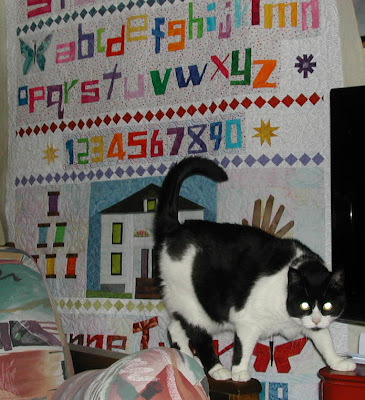 This is my pal Angel, who lives with Julie, who is a friend of Chris, who quilted Mom's Alphabet Sampler Quilt. Angel and Julie and Chris live in Tennis-see, which explains why this quilt has been doing a lot of flying lately. It is on its way home to us. Mom is very eager to get it back. 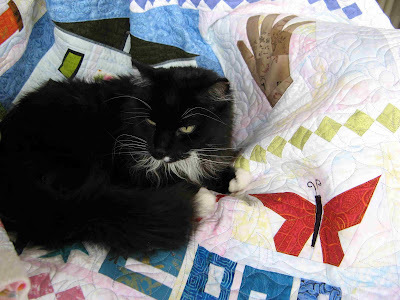 As you can see, Angel is hard at work, performing a QA inspection on the quilt. Angel reports the quilt was quilted with love and kindness, and that there are huge doses of happiness and friendship in each stitch. 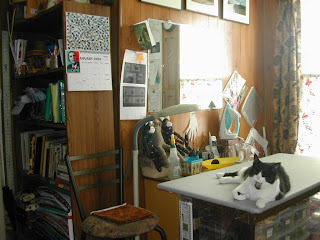 There are more pictures of the quilt over on Mom's quilting blog, The Patchery Menagerie. Much though I appreciate Angel's hard work, I am eager to replace her scent with my own, and I'm the one that will give this quilt the final Quality Assurance inspection. I mean, like, seriously, whose quilt do you think it is, anyway? Mom's Alphabet Sampler Quilt is flying back to my house from Tennis-see where it was quilted. I am waiting to perform the final QA inspection, but I gotta say it's looking pretty good. 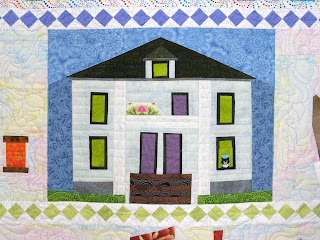 You can click the photo to biggify, and there are more photos over at Mom's quilting blog. The final unveiling will be on Friday. You guys can all see me in the window, can't you? It's Sunny! 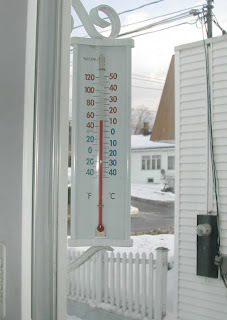 It's Warm! It's MELTING! Well, you know, whatever makes Mom happy. That can work for me too. I dunno what made Mom decide to give me stinky goodness every night, but I sure do love it. I pester her as soon as she puts her puffy coat in the closet. I follow her around and meow loudly. I even rub up against her leg! 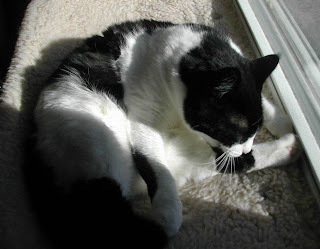 While she is opening the can and putting my stinky goodness in a nice clean bowl, I hop nearby and MEOW. I follow her every footstep until she puts the bowl down. Then I dive right in. Yes I am so excited I eat standing up. It's supposed to be warm and sunny today. Yay! Those are two chick-hens on the bottom pan. Why, oh why, couldn't they have been BEEF? Mom was taking pictures of her recently cleaned sewing room, and I just had to get into the act.